A couple of years ago, I had a craving for a hot fudge sundae. But not any old hot fudge sundae, you see, I had to have ice cream topped with my mom’s hot fudge. I *kind of* remembered the ingredients and amounts, but not really. What I definitely knew was that my mom’s recipe used evaporated milk. So I searched the internet for a hot fudge recipe using evaporated milk. All I could find was recipes using half and half or heavy cream. So I called my mom. She didn’t answer. I don’t recall if my mom had a cell phone at that point, but even if she did, it was almost always on vibrate in those days, so she wouldn’t have heard it anyway. And besides, I needed hot fudge sauce right then! So I used a recipe similar to what I thought my mom used and was gravely disappointed. Since then, there’s probably a copy of my mom’s recipe in every notebook I own, as well as on a few post-its here and there. And now my mom and I text all of the time, so I’ll never be without the recipe, anyway. Plus, it’s now immortalized on the Internet, so I can look it up any time I want, from anywhere I please. My mom prefers to make brownie sundaes (and really, they are something to behold), but since I’m more of a cookie person, and I’d been craving M&M cookies for sometime now, the cookie sundae made an appearance. The assembly is simple: a scoop or two of high quality vanilla ice cream, a cookie or two, and hot fudge sauce (the more, the better). Melt butter over moderate heat in medium saucepan. Add chocolate chips, whisk to melt. Slowly pour in evaporated milk while whisking. Add powdered sugar in 4 batches while whisking. Bring mixture to a boil. Boil for 8 minutes, then remove from heat. Stir in vanilla and cool slightly. Pour over ice cream. *Incidentally, since my search all of those years ago for a hot fudge recipe using evaporated milk, Peabody posted a similar recipe not too long ago. The proportions aren’t exactly the same, but they’re not too far off. I’ve loved drooling over her blog for awhile now…this recipe just cements what I already knew: she posts awesome, drool-worthy recipes! Preheat oven to 375*F. Line 2 baking sheets with parchment. Sift baking soda, salt, and flour into medium bowl. Cut butter into 8 pieces and beat with paddle attachment until smooth (if using a hand mixer, use a large bowl). Add shortening, beat until combined. Add sugars and beat on medium speed until creamy. Add eggs, 1 at a time, until just mixed, scraping down the bowl if necessary. Add vanilla. With mixer on low, slowly add flour until just incorporated. Fold in candy. Drop dough by tablespoons onto baking sheets. Bake 9-11 minutes or until cookies are light golden. Cool on pan for 5 minutes before removing to baking sheet. That looks so good! I am not a big sundae person but I’d go for that in a heart beat! Yum yum! That is truly delicious and tempting. I can’t wait to have my own! I probably do this in our dinner’s desert. My kids will surely love this and asked for more. It’s called Velvet Fudge Sauce. You can still find the recipe under this name online. It is SO good! That one is actually indulging and tempting. 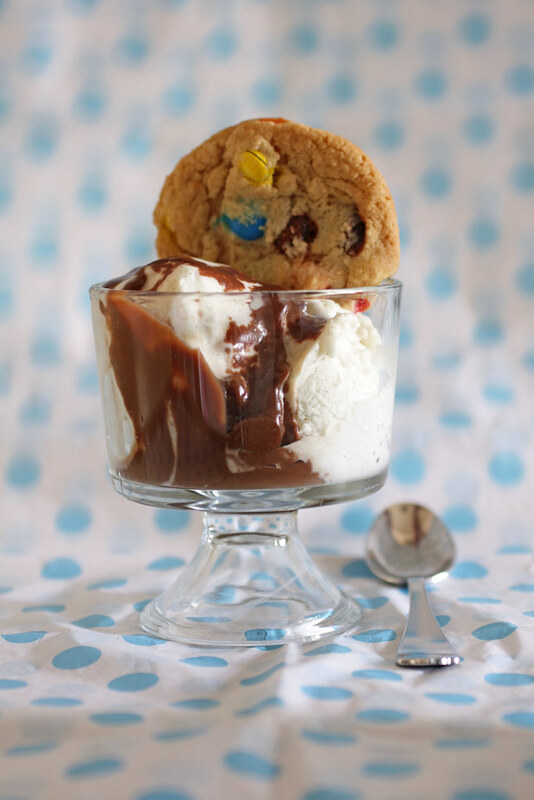 The ice cream and cookie combination is perfect plus the chocolate syrup. Yum! Thanks for sharing this recipe. I noticed when I looked up that recipe that the proportions were a bit different, so I’ll have to try that too, to see which I like better. Do i need to reheat it when taken out from fridge for the leftover hot fudge sauce?